Momo is a leading Chinese social networking and dating company. The company recently acquired Tantan which is expected to drive further growth. The company has a strong moat and an ambition to become an international player. Valuation suggests Momo’s shares are extremely undervalued. Shares of Momo, Inc. (MOMO), a leading Chinese social media and dating company, are very likely to set for an unprecedented rally as the company recently acquired a fast-growing dating platform called Tantan and trades at unreasonably suppressed levels. Momo is a Chinese holding company operating an identical-branded mobile-based social networking platform. The company’s platform enables its users, customers and partners to establish, maintain and develop their relationships through private and group communication tools, content sharing as well as discovering people nearby and attending diverse offline social events. Last year, the company took over Tantan, China’s prominent dating app, with more than 20 million monthly active users. All revenue generated by the company comes from China. Reading through Momo’s latest quarterly earnings call transcript, one can come across several points that reveal the key tenets which stand behind the company’s successful business model growth recipe. Further in the call, the management highlighted outperformance in the virtual business gifting and positive contribution of 'See Who Likes Me' feature to an increase in average revenue per paying user. Beyond these key business drivers in the current quarter, the company’s representatives also discussed its strategy for the upcoming quarters – which is expected to primarily revolve around Tantan and international expansion. During the next few quarters, the company plans to focus on seizing operational improvements as the macro environment is not seen to be entirely favorable. Lastly, with respect to its user base, Momo aims to leverage a new use case and to go after a huge amount of existing dormant users, which it intends to pull back. As China is one of the most populous countries with still a relatively low internet penetration rate, the company’s potential for a considerable expansion seems still to be vast. 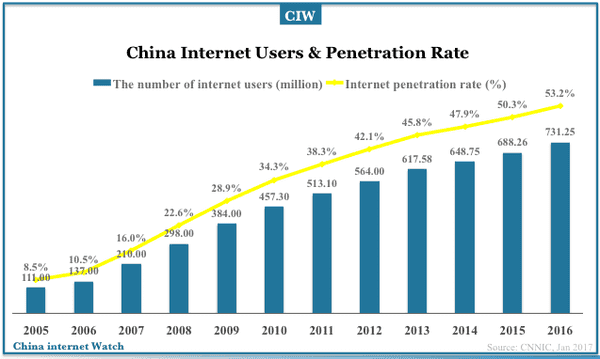 According to a study by China Internet Watch from July 2017, there were approximately 750 million internet users in China. This represents an internet penetration rate of roughly 54 percent and more than 1 percentage point increase over the 2016 figure. To put this into context, the internet penetration rate in the United States and other developed markets is currently well above 90 percent. Every extraordinary company usually has some type of moat and Momo is no exception. Springing from the positive demographic trends, Momo’s platform has a strong networking effect moat which, according to a recent article by fellow contributor Raijnath Ramraika, CFA, belongs to one of the best and most sustainable moats. With a 100 million monthly active user base which is still growing, the company’s network will become increasingly more valuable as time goes by. In March 2019, the company’s immomo.com website’s traffic counted approximately 1.7 million visitors. According to Similarweb.com, most of the company’s visits come unsurprisingly from China, with the United States, Hong Kong, Taiwan and Singapore accounting for the rest. Even though Momo’s absolute web traffic figures are still not in the top country and category ranking, the statistics showcase an upward tendency which is likely to persist. Plugging in Momo's financial statements' figures into my DCF template, the company’s shares seem to be heavily undervalued. Under the perpetuity growth method with a terminal growth rate of 2 percent, 45 percent annual revenue growth rate assumption (decreasing by 5 percent each year over the next five years) and stable 25 percent EBIT margin, fair value of the stock comes at US$128. 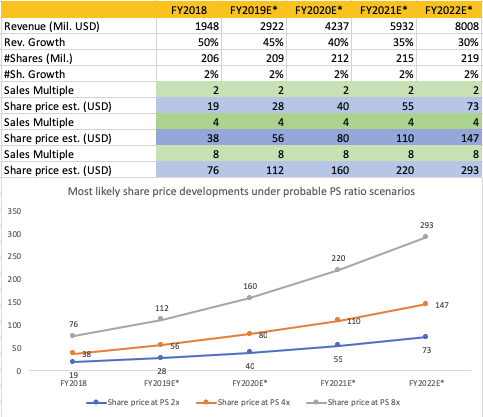 Under the EBITDA multiple approach of a discounted cash flow model, the intrinsic value per share value of the company stands roughly at US$102 if we assume that the appropriate exit EV/EBITDA multiple in five years' time is around 10x. From a different perspective working with operating earnings multiples, Momo's shares look also greatly underappreciated. Using the Fast Graphs forecasting calculator with a default 20 percent adjusted operating earnings growth rate assumption, the company's intrinsic value by the end of December FY2024 is forecast to reach up to US$112. This implies a total annualized rate of return upside potential up to 20 percent. Lastly, in the light of revenue variation of Peter Lynch's popular earnings line for the projection of probable per share values of the company, Momo's shares' long-run potential seems to be favorably skewed to the positive expected return territory. According to my model, assuming 45 percent annual revenue growth decreasing gradually by 5 percent each year, 2 percent annual equity dilution factor, a price-to-sales ratio of around 4x, the company's share price by the end of 2022 could hover around US$147. This scenario suggests an annualized rate of return potential of as much as 37 percent in the following years. 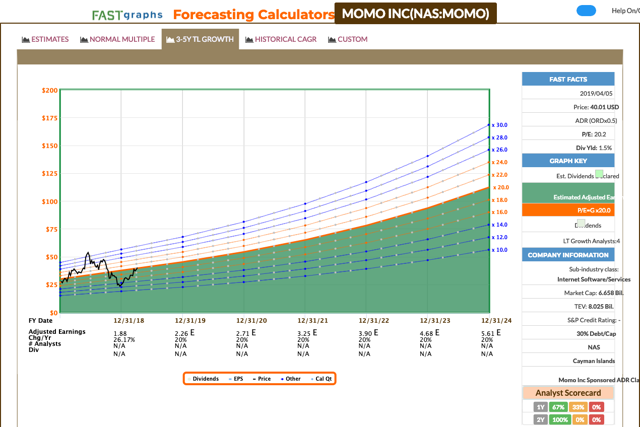 Should Momo’s price-to-sales ratio decline to 2x, the implied return potential by the model diminishes to roughly 9 percent. If the company fails to retain its existing users and grow its user base, or if the user engagement on its platform declines, the company’s operations and financial results may suffer. The company’s operating history so far is very limited and therefore its strategy and economic prospects may not materialize. Most of the company’s revenue is currently concentrated in a live video service segment which may not enjoy the current growth rate for a prolonged period of time. The company’s business is dependent on the strength of the company’s brand and its perception, and hence any negative publicity or user misconduct may harm the company’s reputation and have an adverse impact on the company’s operations and financial results. Fierce competition in the sector may put pressure on the company’s profit margins. If the company fails to keep up with the technological developments, its operations and financial results may be negatively affected. If the company fails to effectively protect its intellectual property, its business may be adversely affected. If natural disasters or epidemics occur, the company’s operations and financial results may be adversely impacted. To sum up, Momo is an outstanding company with a strong moat inherent in its business. Founded relatively recently in 2011, the company’s growth potential is still very likely to be largely unmaterialized. China with a population of over 1 billion represents a more than 3 times bigger market than the United States, yet the company’s current user base totals just a little over 100 million people. I believe once the access to the internet fully spreads over the country, Momo’s true potential will be unleashed.